Do not jump on ancient uncles. Do not yell at average mice. Do not wear a broom to breakfast. Do not ask a snake’s advice. Do not bathe in chocolate pudding. Do not talk to bearded bears. Do not smoke cigars on sofas. Do not dance on velvet chairs. So when my sisters and I saw the “PLEASE TOUCH” sign at several exhibits in The National Building Museum, we immediately assumed that the sign was wrong. A museum staff worker and a large display dedicated to “PLEASE TOUCH” assured us that it was not a mistake. 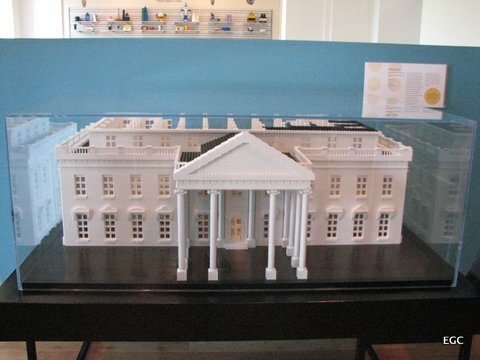 Among a variety of glass-enclosed artifacts, visitors are actually encouraged to touch certain items such as a model of the capitol building. Although that wasn’t a particularly thrilling experience, the hands-on approach to exploring different kinds of terracotta materials was educational. Glazed terracotta is definitely smoother than its unglazed, rough counterpart. Learning to lay bricks in structural bonds using miniature three-holed bricks was also instructive. Photography was forbidden, as were cell phones, but staff could be lenient. “It’s ok,” one worker said when my father’s cell phone rang inside the exhibition hall. 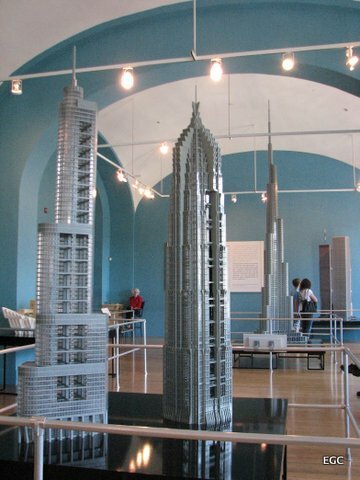 She later pointed my family to the LEGO Architecture exhibit on the second floor. 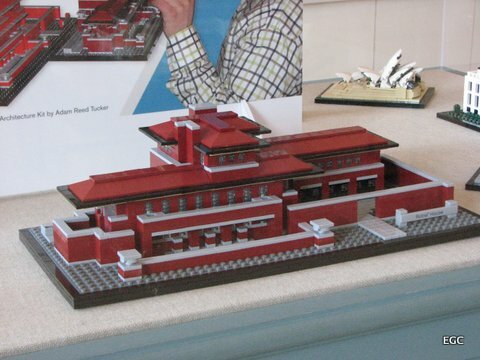 The kit for Frank Lloyd Wright’s Robie House sells for about $150. On the right, a skyscraper from Shanghai is shaped like traditional Chinese pagodas. St. Louis’ Gateway Arch stands complete with the windows at the peak for the tourists’ ride. The White House stands low beneath the skyscrapers. 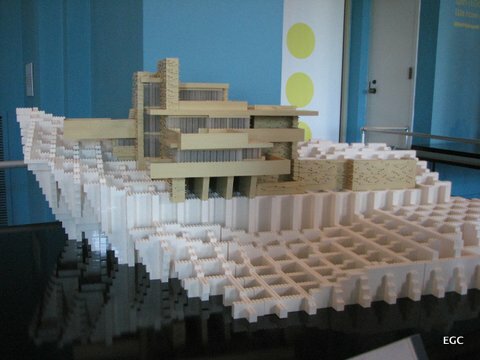 Frank Lloyd Wright’s Fallingwater house sits atop the LEGO whitewater. 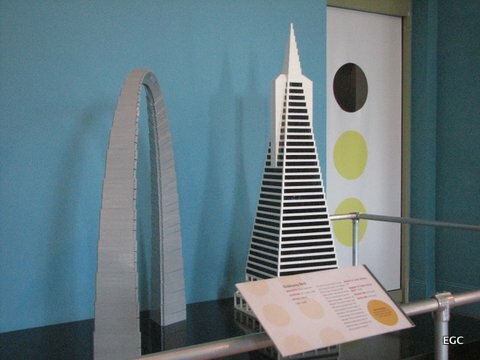 Buildings from all over the world were recreated in this LEGO Architecture exhibit, which runs until September 3rd of this year. 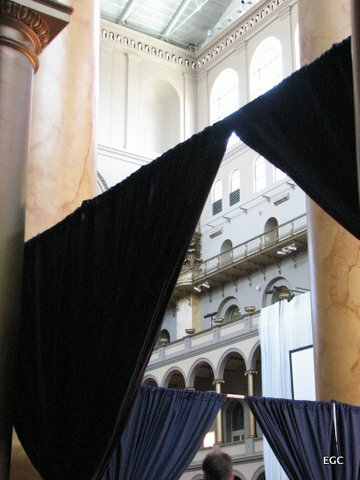 Curtains dividing the museum’s great hall into sections for that evening’s gala hosted by the Korean Economic Forum. 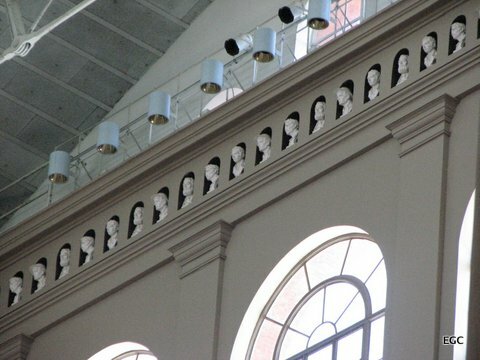 Sculptures lining the upper edge of the three-story great hall of the National Building Museum. Only I, the eldest, seemed interested in playing with LEGOs. 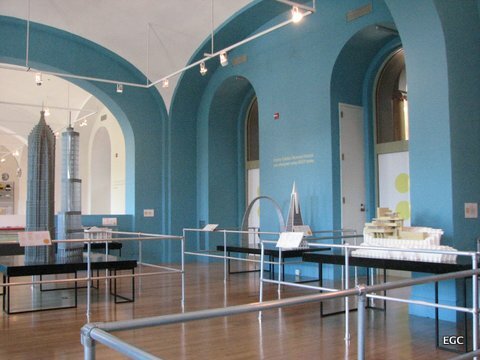 Tags: architecture, Exupery, frank lloyd wright, karla kuskin, lego, National Building Museum, rules. Bookmark the permalink.